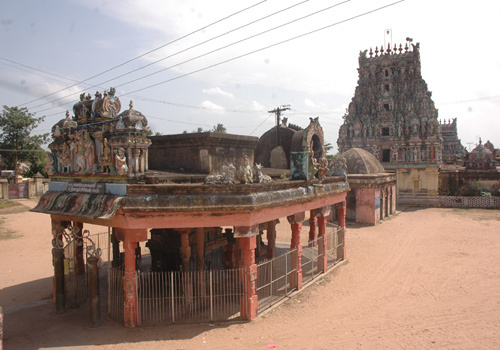 This sivasthalam temple is located in Nagapattinam town. A Divya Desam shrine of Lord Vishnu is also located at Nagapattinam in the vicinity of Shiva temple. Nagapattinam Kayarohanaswamy temple is one of the sapthavitanga sthalams. It is better known as the temple of Neelayadakshi. The main deity in this temple is Kayarohanaswamy. It is believed that the lord blessed his devotee Sage Pundari to attain moksha with his body. The rishi also asked for moksha for his descendants, and till this date, when anyone from the sages family passes away, the body is brought to the temple gate, where the lord's clothes and garlands are brought to adorn the body, thus blessing it. Lord Shiva as a Swayambumurthy appears very handsome. Tirukarthikai in November-December are the festivals celebrated in the temple. People pray for relief from the sins committed and for salvation. Devotees perform abishek to Lord and Mother and offer vastras. The temple is open from 6.00 a.m. to 12.30 p.m. and from 5.00 p.m. and 9.30 p.m.
Sri Kayaroganeswarar Temple, Nagapattinam-611 001. Contact Number - +91- 4365 - 242 844, 98945 01319, 93666 72737. The temple is praised in the Thevaram hymns of Saint Gnanasambandar. 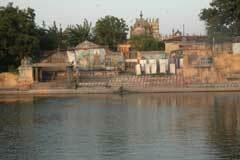 This is the 82nd Shiva temple on the southern bank of Cauvery praised in Thevaram hymns. The fruits of the Mango tree taste citric, sweet and bitter. Viewing the tree from the southeast prakara, it looks like a Nandhi. Emperor Mushukunda got seven Lingas from Indira for the helps he had rendered him. These Lingas were small ? Vidanga in size. The Emperor installed the Linga in Seven Places called Saptha Vidanga sthalas. This is one such Sthalas with a Linga so beautiful made of Ruby. Hence, the Lord is named Sundara (beautiful) Vidangar. Lord Thyagaraja is in a separate shrine right of the sanctum sanctorum. 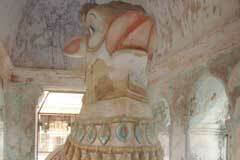 In majority of the temple, people can see only the face of Lord Thyagaraja. During the Vaikasi Visaka and Margazhi Tiruvadirai festivals, Lord is dressed (Alankara) showing His right hand and feet. Lord comes in procession waving His hands to and fro and in a dancing form. This dance is called Paara Vaara Natanam. Generally, temples are closed if a death occurs in a nearby place. In this place, the garlands and the clothes ? vastras used for the Lord is placed on corpse. A fisherman, Adhipathar attained salvation with the grace of Lord Shiva in this place. Remembering this event, as a mark of respect to the community, this practice is followed in this temple. The body is placed before the temple without closing the doors. The garland and the vastras used for the Lord are placed on the body. During festival procession, Lord goes round the Mada Veedhis (Streets) and return to the temple. But Lord beginning his procession from this temple, goes to seven places ? Poigainallur, Poravacherry, Sikkal, Palur, Vadagudi, Thethi and Nagoor. Maharaja Salija worshipped Lord Shiva and performed puja in these seven places. The present system is to remember this history. Against the practice of Lord coming in the Vrushab vahan on Pradosham days, Lord Vishnu too accompanies Lord Shiva in the guise of Mohini. When the milk ocean was churned, Nectar came out and was served by Lord Vishnu to Devas. Devas failed to pray to Lord Shiva who swallowed the Halahala poison to save the world. Realizing their folly, they begged the pardon of the Lord. Showing His mercy to them, Lord Shiva danced on Nandhi. This dance took place at the Pradosham time. Lord Vishnu?s Mohini Avtar took place a little before this time. This Vishnu darshan is available to the devotees on Pradosham day only. Emperor Dasaratha came to know that Planet Saturn would be splitting the Rohini star causing severe famine in his country. He planned to fight Saturn to prevent him from doing so. Sun God advised Dasaratha to drop his plan but to beg Saturn to change his transit route in public interest. Saturn also admired the earlier plan of the emperor to meet him in war for the sake of his subjects without any selfish motive personally. The planet yielded to the emperor?s wish. Remembering this event, all the planets (Navagrahas) in the temple are facing west-the Lord. As a child adamantly demanding the mother to get its wish, there was a Siddha in the place called Azhuguni Chithar ? crying adamantly for a wish. He used to cry in the shrine of Mother Neelayadakshi demanding salvation. He was the disciple of Gorakka Siddha. He stayed in the temple, cried for getting his demand. Mother spoke to Lord Shiva of the issue. Lord granted salvation to Azhuguni Chithar. His Jeeva Samadhi is in this temple. Special pujas are performed to Siddha on Vaikasi Visakam day. Also special pujas are performed here offering porridge (Payasam in Tamil) as nivedhana on poornima ?full moon ? days. Lord Bhairava, usually appearing with His dog vehicle, has Lion ? Simha as his vahan. When Sage Pundarika worshipped Lord Shiva here, Holy Ganga sprang up in this place along with Lord Bhairava. He is gracing as Kala Samhara Bhairava in this temple. The Simha vahan is behind Him. It is believed that Lord Shiva Himself is gracing the devotees who hit Yama the God of Death. As Lord Kala Bhairava is facing South, devotees pray to him for longevity. As He looks furious, two smiling Vinayakas are installed before Him. There is a shrine for Mother Ashta Bhuja (eight hands) Kali in the temple. The deities for the eight directions have their due place in the temple. Mother Gajalakshmi in Her sitting form graces the devotees with two elephants offering abishek. Lord Dakshinamurthi is in the ghoshta wall with His four disciples. As the temple is on a sea shore, it is said that Lord Shiva is ruling the region as a king, hence the name Shiva Rajadhani ?capital of Shiva Kingdom. Behind the Linga in the sanctum sanctorum is the Somaskanda form of Lord Shiva. Lord Shiva comes to the sea for a bath on the Masi Magam day in February-March. The idol of Lord Muruga is made with 12 hands with weapons. He is praised in the Tirupugazh hymns of saint Arunagirinathar. The Zodiac circle is in the Mandap. People pray from here for relief from planetary problems. The event of sage Pundarika entering the shrine of Lord Shiva and merging with Him is celebrated during the Arthajama Puja (the last puja of the day) on the Ayilyam star day in the month of Aani-June-July. Sri Chandikeswara shrine is on the side of prakara. Sage Pundarika as advised by Sage Kanwa performed penance on Lord Shiva seeking salvation. Granting His darshan, Lord embraced the sage and granted salvation. As a rule, the soul merges with the Lord attaining salvation. But in this case Lord embraced with the body (Kayam in Tamil) with that of Sage (Aaroganam). Hence Lord is named Kaya (body) Aarogana (embracing) Easwarar-Lord ? Kayaroganeswarar. Kalyanasundareswarar Temple, Nallur, Thanjavur, T..
Sri Achaleswarar (Vandarkuzhali) temple, Arur Ara..
Aappudaiyaar Temple , Madurai ,TamilNadu.